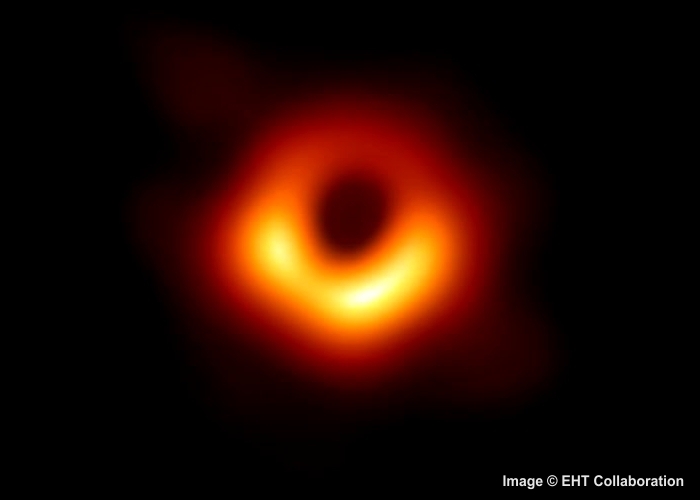 You are looking at the first image of a black hole, captured by a network of radio telescope observatories collaborating under the name Event Horizon Telescope (EHT). The super-massive black hole (SMBH) is at the center of the giant elliptical galaxy M87, located in the constellation Virgo. The SMBH has an estimated mass 6.5 billion times that of the Sun — around 1.3×1040 kg. The image was released on April 10, 2019 by the EHT team. EHT trained its sights on both Pōwehi and Sagittarius A*, the SMBH at the center of the Milky Way. But it was easier to see Pōwehi since it’s less variable and can be imaged over longer periods of time. It’s also in a direction where the line of sight includes a lot less dust and gas than for Sagittarius A*. So even though Pōwehi has a slightly smaller apparent size (calculations below) it yielded a better image. 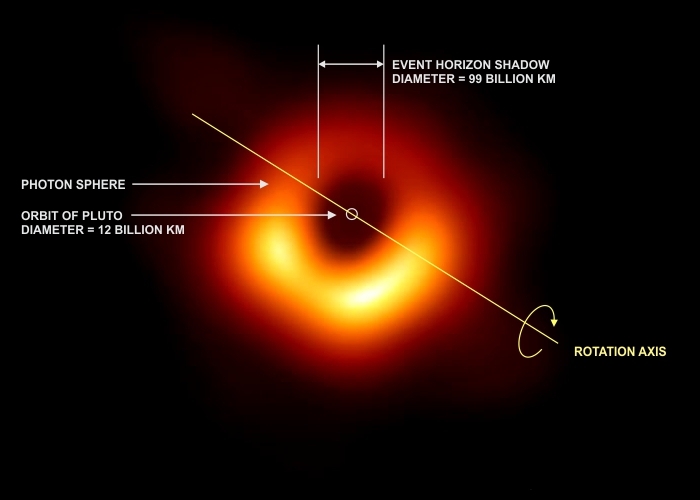 Note: What the EHT imaged was the shadow diameter of the black hole, not the diameter of the event horizon itself. The former is about 2.6 times the latter, and is an image of the true event horizon distorted and expanded by intense gravity near the SMBH. This expansion factor of 2.6, calculated theoretically from our current understanding of gravity, means the SMBH event horizon is 38 billion km in diameter. The following calculations use the shadow diameter since that’s the central dark area we see. θ = tan-1[(9.9×1010 km)/(5.2×1020 km)] = 1.1×10-8 degrees. θ = tan-1[(6.0×107 km)/(2.4×1017 km)] = 1.5×10-8 degrees (about 1.4 times larger than Pōwehi). These are the two closest SMBHs available for study. The closest stellar-mass (“normal” size) black hole is in the constellation Monoceros at a distance of “only” 3000 LY (2.8×1016 km), but its diameter is a mere 30,000 km. This yields an angular size of θ = 6.1×10-11 degrees, far too small to image with today’s technology, so astronomers went after the big game first. Still, imaging Pōwehi has been compared to reading the date on a coin in Los Angeles from New York. More result will soon be released by the EHT team, including improved resolution images from software upgrades, the addition of more radio telescopes to the network, and ultimately an image of Sagittarius A*. In the meantime, here’s what we think this first image shows. The dark blob at the center is the shadow of the event horizon of the SMBH. The event horizon is a spherical region around the black hole, at which distance escape velocity exceeds the speed of light. Hence, no light can be emitted and it appears dark compared to the background. The SMBH is rotating at very high speed. Its rotation speed has not yet been measured, but for other black holes rotation speeds (at the event horizon) have been measured at 50% to 80% the speed of light. You can see the SMBH shadow is slightly oblate, so the spin axis would be perpendicular to the larger diameter. The bright ring around the shadow is known as the photon sphere. In fact, it would appear largely the same if viewed from any direction, so is sometimes called the photon ring. It’s made of photons of light temporarily trapped into nearly circular orbits around the SMBH. That light comes from background stars behind the SMBH, as well as from energized matter falling into the SMBH. Since the image was reconstructed from radio waves, it was rendered in false color to show what the human eye might see in visible light. Because the SMBH is rotating, an effect called relativistic beaming would cause the light of the photon sphere to be brighter on the side that’s rotating toward us, and dimmer on the side rotating away. That would explain the brightness asymmetry in the photon sphere, though it doesn’t exactly line up with the inferred rotation axis. Finally, for a sense of scale, Pluto’s orbit is shown as a small white circle. It has an average diameter of 11.8 billion km. This is why we call these behemoths SMBHs instead of just “black holes”. The trick to getting images of objects with such tiny angular sizes is a processing technique called aperture synthesis. A fundamental law of optics says that the larger the aperture (diameter) of your imaging device, the greater the detail you will see. 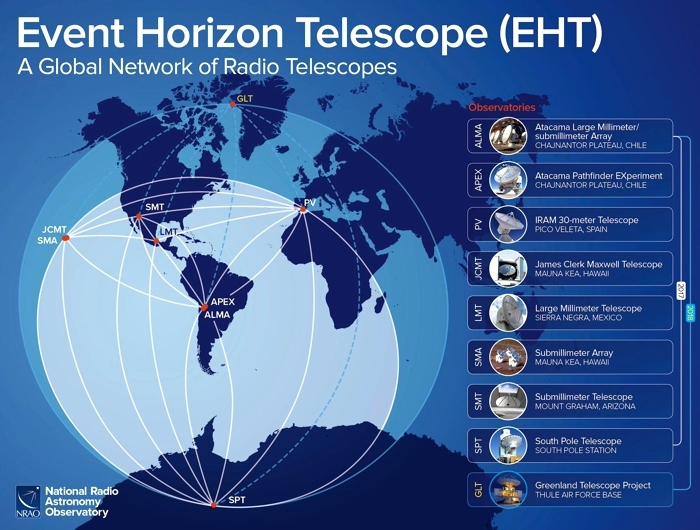 The eight radio telescopes used in this project were spread around the globe, but by linking them together digitally aperture synthesis allowed their individual data to be combined. So the total telescope aperture was effectively the diameter of Earth — 12,000 km (8,000 miles). That’s a big dish, considering the individual radio telescopes ranged from 12–50 meters in diameter. Aperture synthesis has been used in the past with smaller arrays, like the VLA in New Mexico. The math is highly complex and requires processing on a supercomputer called a correlator. Individual observation data must be corrected for the slightly different arrival times at each radio telescope (since they’re spread out across the globe). The total amount of EHT data was nearly 5 petabytes (1 petabyte = 1024 terabytes), so even high speed internet would have taken too long for data upload. It was more time-efficient to ship the physical hard drives to the two correlators, located at MIT Haystack Observatory and the Max Planck Institute for Radio Astronomy in Bonn, Germany. It’s worth noting that all the features seen in this image were predicted by Albert Einstein’s Theory of General Relativity — published over 100 years ago. So although astronomers had a good idea of what to expect, they had to wait until 2019 for verification. I even attempted a graphic model based on current theory back in my July 7, 2014 post, but I grossly underestimated the thickness of the photon sphere. This ground-breaking image of Pōwehi by EHT represents the state of the art for radio astronomy, and is a harbinger of exciting discoveries to come. Expect followup posts as further images are released.